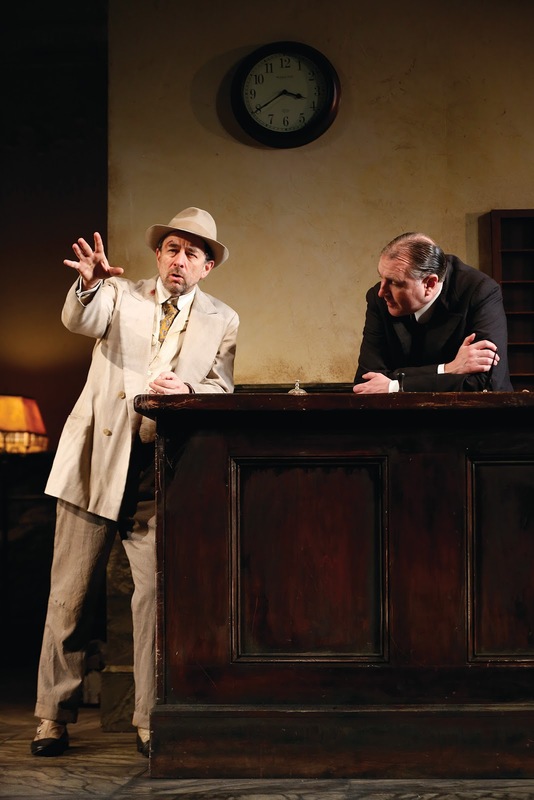 In this short play by Eugene O’Neill, Richard Schiff plays Erie Smith, a run-down, two-bit gambler whose luck has run out since the death of Hughie, the night clerk at the cheap hotel where Erie stays. The play is one long scene. Erie stumbles into the hotel in the middle of the night, on the tail-end of a multi-day bender, and starts spinning stories at the new Night Clerk, played by Randall Newsome. This current Night Clerk smiles and nods, but couldn’t care less about Erie or his exploits, and would prefer for Erie to go to bed and leave him alone so that he can blankly wait out the night until his shift is over. Through Erie’s meandering chatter over the rest of the course of the play, we come to find out how much Hughie meant to him and how telling his stories to Hughie made Erie feel more impressive and more successful than he really is. Erie’s joking, prodding, and generally talking at the Night Clerk slowly wears the Clerk down, making him realize that he doesn’t have to just pass the time, that maybe he can actually connect with Erie. The play ends on a hopeful note: perhaps with the new Night Clerk, Erie can find friendship and meaning again and get over Hughie’s loss, and perhaps the Clerk can become a bit more alive by rolling dice with Erie and listening to his exaggerated tales of adventure. Hughie works as detailed character study of these three men: Erie, the Night Clerk, and the never-seen Hughie. But it is also a delicate exploration of the idea that we all need to be seen. We need to have someone to talk to at the end of the day. Without someone to hear our stories, without someone to perform for, without someone to reflect ourselves back to us, who are we? We are lost in the world. Without witness. When Erie loses Hughie, he loses himself. I think this production, directed by Doug Hughes, could well be the ideal performance of this play. 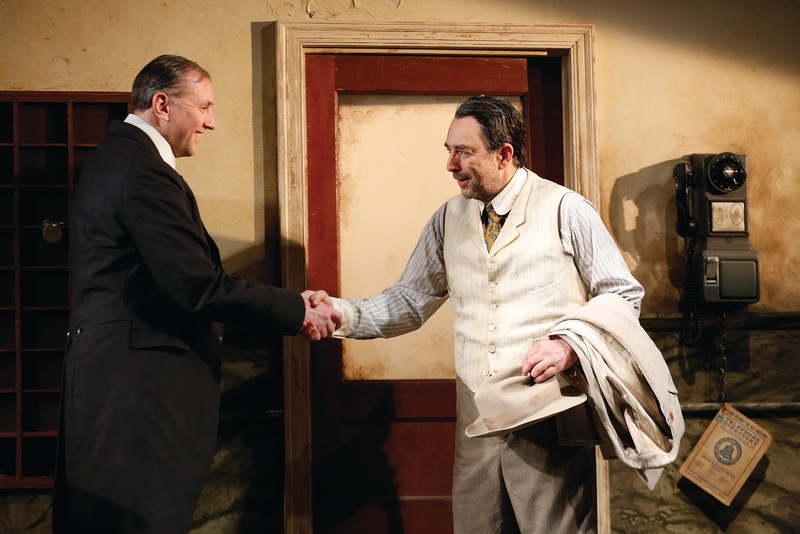 Richard Schiff is excellent as Erie, making both his grandiosity and vulnerability palpable, not to mention making O’Neill’s 1920s slang-filled monologues actually seem natural and believable. Hughes’s main addition to the play is to include a voiceover reading part of O’Neill’s stage directions that explain what the Night Clerk is actually thinking while he pretends to listen to Erie. The disjuncture adds some needed comic relief and helps to flesh out the character of the Night Clerk. Ticket prices for Hughie range from around $45 and go as high as $100 for a Saturday evening show. With that, I do feel like it has to be asked, is this incredibly well done but only 55 minute show worth $100? Pricing and theatre and evaluating ‘worth’ is a tricky game at best, but I do wonder why Hughie couldn’t have been paired with another one act (O’Neill or otherwise) to make a fuller evening? With my free press ticket, the show got to be a delightful little morsel, a Sunday evening treat, of both theatrical craft and a compelling idea. But – if one had paid full price, I can see how they might walk away frustrated at still being hungry. 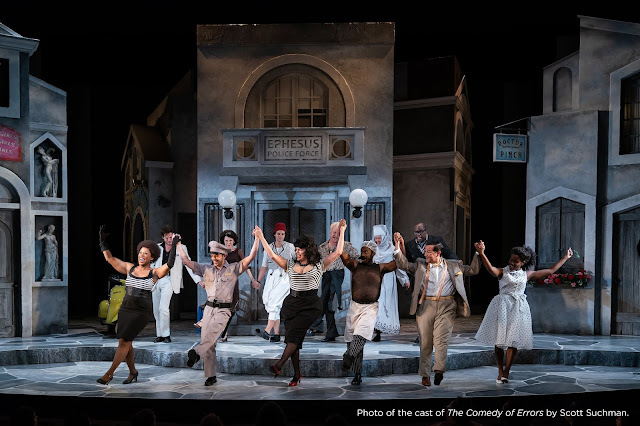 Randall Newsome as Night Clerk and Richard Schiff as Erie Smith in the Shakespeare Theatre Company’s production of Hughie, directed by Doug Hughes. Photo by Carol Rosegg.